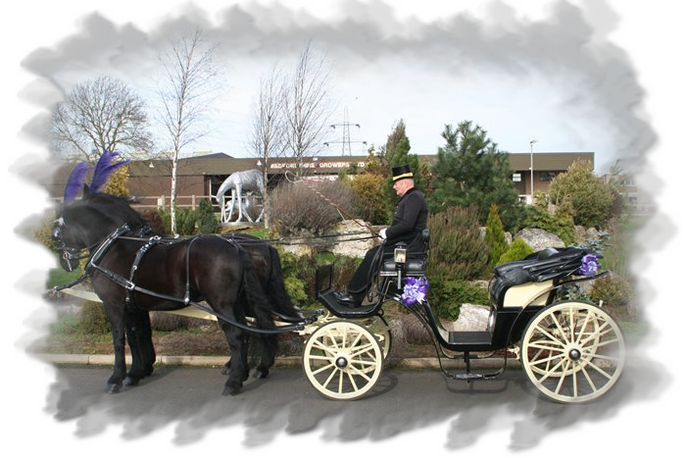 The Victoria is a pretty carriage much easier to get into and out of in a wedding dress due to its lower riding height. This carriage was designed for Queen Victoria, in her later years, so she could still easily get into a horse drawn carriage to travel. It also has a large single hood, large enough to cover the occupants in bad weather. Though in English the name victoria was not employed for a carriage before 1870, when one was imported to England by the Prince of Wales in 1869, the type was made some time before 1844. It was very popular amongst wealthy families. On a low body, it had one forward-facing seat for two passengers and a raised driver's seat supported by an iron frame, all beneath a calash top. It was usually drawn by one or two horses. This type of carriage became fashionable with ladies for riding in the park. 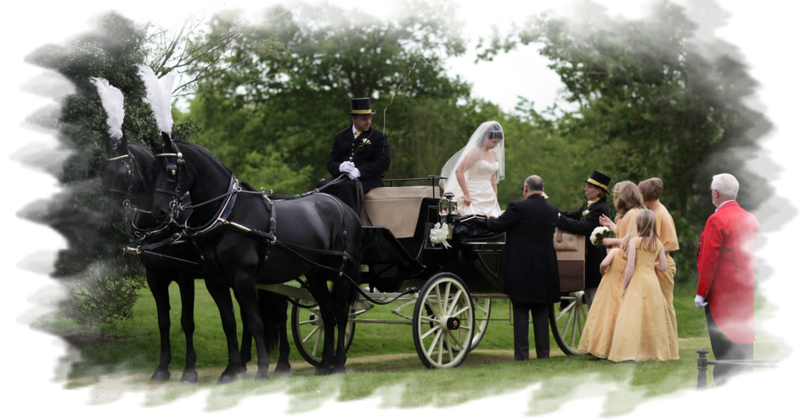 The landau’s are the more popular carriage for brides, probably due to looking more grand and with a double closing hood for inclement weather. This carriage's the body shape is rounded and appears in a canoe form. This carriage is named after the Earl of Sefton, for whom Messrs Hooper developed this rounded bodied, lighter Canoe- or Sefton Landau. Wagonette Break Introduced in the late 1860’s they were generally used as utility vehicles, driven by the owner or professional coachman. They were used for exercising coach or carriage horses either as a pair (2) or a team (four in hand) and sometimes taking staff and extra luggage or furniture from house to house or train station. The break can seat up to eight passengers on bench seats with passengers facing each other. We use this vehicle for larger groups of people, for example taking passengers to and from racecourses and school proms.